15 of Charlotte’s most magnificent trees shine under the North Carolina Forest Service’s Champion Big Tree Program, bringing more than a title to the Queen City’s crown. While civic pride reached heightened levels in Charlotte when the Carolina Panthers made it to Super Bowl 50 as NFC champions, it turns out there is another group of extra large, equally stout champions among us, just as worthy of admiration. Fifteen of Charlotte’s most spectacular trees reign as N.C. Champion Big Trees, a special designation of honor the N.C. Forest Service has established. 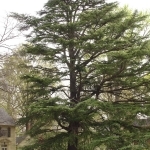 The largest on the registry for Mecklenburg County is a huge deodar cedar in the front yard of a private owner. Others on the list include a lilac chaste tree and a Japanese zelkova. The N.C. Champion Big Tree Program was established in the early 1970s to recognize and celebrate the state’s largest trees. More than 400 trees across the state carry the designation. Charlotte’s tree canopy offers benefits extending well beyond majestic, four-season beauty. Trees provide significant contributions to the environmental health of our community. “Trees are very beneficial to urban environments,” said Erin Oliverio, tree canopy program manager for the City of Charlotte. She pointed to the county requirement of leaving an undeveloped buffer area beside most creeks as an example of one way trees help improve water quality. “They intercept water; prevent excessive runoff and uptake pollutants, helping clean the water before it reaches creeks. N.C. Forest Service lists more than 220 species eligible to be considered for the Champion Tree program. The list includes common and recognizable species such as ash, cedar, dogwood, elm, hickory, holly, maple, oak, sweet gum and tupelo. Some of the less well-known and unusual species are franklinia, glossy privet, hemlock, lilac chaste tree, northern catalpa, swamp cyrilla and torreya. Any Tar Heel tree that’s on public or private land and is a native species is eligible for nomination if it meets minimum circumference and height requirements. In the past, non-indigenous trees also received recognition, and many of the champion trees in Mecklenburg County, as non-indigenous, would no longer be eligible. 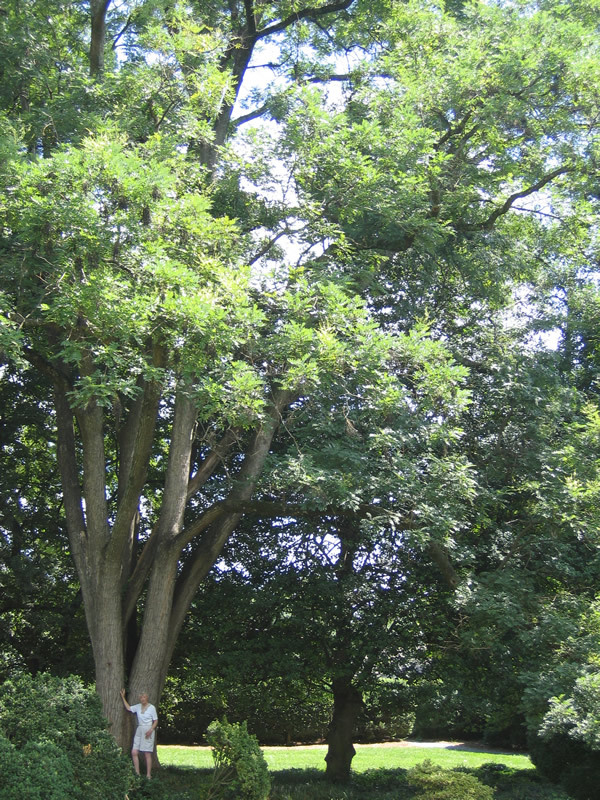 Trees are selected through a system which allocates points based on a tree’s circumference, height and crown spread. The North Carolina program follows the formula established by the national program, established in 1940. Claim to Charlotte’s largest champion tree, with 272 points, belongs to a private homeowner with an enormous, 96-foot-high deodar cedar standing tall in the front yard. The state registry does not list the address of the champion trees. Historic Rosedale Plantation on North Tryon Street, built in 1815, is home to two champion trees: an Alaska cedar, registering 137 points and 41 feet tall, and a 61-foot-tall Chinese parasol tree. Elizabeth Myers, Rosedale Plantation’s head gardener, said records indicate the Chinese parasol was planted as a seedling in 1950 by Louise Heagy Davidson who had lived in the home since 1914. “The notes indicate she took three seedlings from the uptown home on North Tryon Street from the garden of Mrs. Lillington Smith, a well known gardener of the time,” Myers said. South Charlotte’s Wing Haven Gardens is home to a champion lilac chaste tree that gains more points from its circumference (34 inches) than from its height (25 feet). A Chinese elm at a private Charlotte home. A Chinese privet at a private Charlotte home. A glossy privet at a private Charlotte home. A Japanese zelkova at a private Charlotte home. 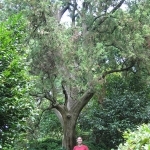 A Leyland cypress, owned by Bartlett Tree Research Laboratories. A pumpkin ash along Colony Road at Runnymede, next to the campus of Alexander Graham Middle School. A sawtooth oak owned by the City of Charlotte. A sourwood, at Sherman Branch Nature Preserve. North Carolina’s largest tree following the formula—with 558 points—is a bald cypress in Martin County. The massive wetlands tree is 76 feet tall and an incredible 468 inches in circumference. Although the state program doesn’t offer any official protection to the trees, the City of Charlotte’s tree ordinance provides some protection to some Champion Trees, according to Laurie Reid, the city’s urban forestry supervisor. Whether a tree has protection under the city ordinance is complicated and depends in part on whether it’s classified as commercial or is on a single-family lot. Reid said if the city’s tree ordinance applies, then removing or pruning a heritage tree—one listed in the N.C. Champion Big Tree list, the American Forest Association’s Champion Tree list, or any tree that would measure 80 percent of the points of a tree on the N.C. list—requires approval and a permit. Because of the legal complexities, the city recommends property owners consult the city’s urban forestry and tree management department before taking action if a large tree is involved. In addition, residents of local historic districts such as Dilworth or Fourth Ward should know that pruning or removing a tree within the historic district might need review and approval by the Historic District Commission. While no funds are available to preserve or maintain the state’s champion trees, the trees’ owners receive a certificate and bragging rights to the largest species in the state. The Forest Service does not check whether trees are lost or damaged after they’re designated, depending instead on self-reporting. It re-verifies only if a champion is challenged by another nominated tree. 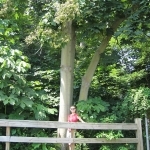 The searchable database, including a complete listing of Mecklenburg County Champion Big trees is found here. Is a Champion Tree the same as a Treasure Tree? Recognizing and celebrating spectacular trees isn’t the sole domain of formal state programs. Charlotte once had a Treasure Tree program, although it’s now inactive. “We helped identify and track trees in the county that were of ecological or historical significance,” Martin said in a 2011 interview with the Charlotte Observer. He said the program was started to help create awareness of the value and importance the trees bring to the urban landscape. The program attracted many supporters, notably Maggie Barker, a local teacher and tree lover who wrote a children’s book identifying area Treasure Trees. Barker’s husband, Donald Booth, a retired research entomologist for a national tree service, was also a Treasure Tree enthusiast. The program is receiving renewed interest today from The Queen’s Crown Initiative, a grassroots effort started by Patrick George, owner of Heartwood Tree Services in Charlotte, and arborist Patrick Anderson. Their goal is to improve and maintain Charlotte’s urban forest cover. The Queens Crown project is mapping trees of significance in Charlotte. TreesCharlotte, a local nonprofit organization committed to maintaining and expanding the Charlotte tree canopy, is working to support the Queens Crown initiative specifically through building upon the past Treasure Tree documentation. Find information here about volunteer opportunities with TreesCharlotte. Michael J. Solender is a Charlotte-based freelance writer.